Students struggle with paraphrasing. Frequently they stay too close to the source text and only exchange words or expressions for synonyms. Occasionally they just copy. Teaching paraphrasing is important if we want our students to cite and document sources correctly and write reports with integrity. The best advice? Encourage students to read the original text carefully; then ask them to recast the passage into their own language from memory. This will prevent them from piecing together their summaries and paraphrases. Last, ensure that students check for accuracy. This exercise can be used with individuals or small groups. First, ask students to read “Humanics,” the original source text below. Then follow steps 1-3. Economists say the United States has lost about five million manufacturing jobs since 2000, twice the losses of the 1980s and ’90s, as offshoring and machines have taken over routine labor. Meanwhile the economy has added tens of millions of service jobs, which require higher levels of education. But white-collar jobs are hardly safe, as artificial intelligence could oust workers from fields as diverse as radiology, accounting, and insurance. We face a churning, unstable labor market, in which everyone is vulnerable to replacement by a robot. We should embrace experiential education, because it is a humbling experience. It leads us to be in tune with the reality, the changes, and the opportunities that exist. We run the risk of becoming like the railway industry, which said, We are focusing on railway transportation—and they missed the airline revolution. Companies are starting universities. Why are they doing that? Because we are not meeting their needs. *This excerpt is based on an interview of Joseph E. Aoun conducted by Scott Carlson: Carlson, S. (2017, November 20). How real-world learning could help people compete with machines. The Chronicle of Higher Education. If you look at your job as a 9-to-5 job, it means that you are not passionate. You are not excited about your job, but you are doing it because you have to. Those jobs are subject to automation. Everything that can be turned into a process is going to disappear. STEP 2: Discuss Plagiarized Version. Let students highlight phrases that were copied verbatim and note the strong dependence on the original’s organization and sentence structure. This version is too close to the original. 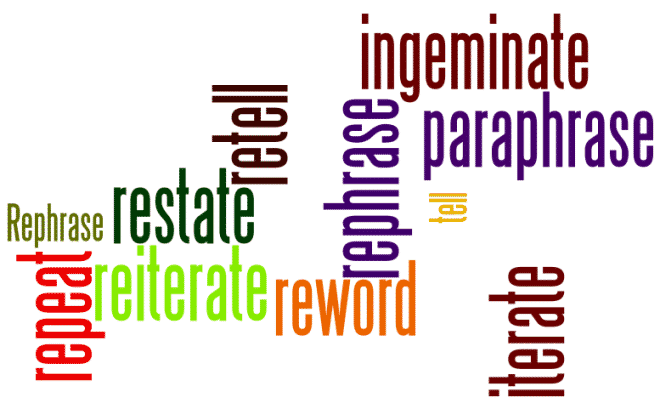 The writer follows the order in which ideas are introduced as well as the sentence structure and substitutes synonyms for some words in the excerpt. Ideally, paraphrases are accurate representations of the original, often summarized or condensed, but recast in the writer’s own words. To avoid inadvertent plagiarism, writers should paraphrase from memory. This type of plagiarism is common. Workers in jobs requiring education, in fields such as radiology, accounting, and insurance, could be displaced by artificial intelligence. The labor market is in flux and unstable; everyone could be replaced by a robot. This is why Joseph E. Aoun, a theoretical linguist, embraces Northeastern University’s co-op model of education, with students working in real-world jobs relevant to their studies. Students must be trained in “humanics”—a blend of data science, technology, the liberal arts, and empathy, he argues. Experiential learning is a humbling experience but it leads us to align with reality, changes, and opportunities. Because the current educational system does not meet their needs, some companies are starting universities. Tomorrow’s workers must be passionate or they are subject to automation. Every job that can be turned into a process will disappear. STEP 3: Paraphrase the Original Without Plagiarizing. Ask students to reread the source text, move it from their sight, and put the ideas in the excerpt into their own words. Below is a potential acceptable paraphrase. Answers will vary. Joseph E. Aoun, a theoretical linguist at Northeastern University, believes that students need to learn in realistic, relevant workplace settings to be competitive in a world that will see automation even in white-collar industries, for example, accounting or insurance. Any jobs that can be streamlined will be replaced by artificial intelligence in a fast changing, unpredictable labor market. Employers criticize the traditional educational system for not preparing graduates for the workplace of the future; therefore, some have started their own universities. Aoun calls for a broad experiential approach he calls “humanics,” encompassing data science, technology, the liberal arts, and empathy. He says that future-proof workers need to be enthusiastic, creative, and multi-faceted. This entry was posted in 4. Classroom Exercises and tagged paraphrase. paraphrasing exercise on January 2, 2018 by bizcombuzz.